In this article, you'll learn how to add headings, content, assignments, discussions, files, and links to your lesson. Lessons can be as simple as a single section of content or a varied, multi-page mix of audio, video, assignments, discussions, and more. Various lesson elements let you embed audio, video, and other files. You can also use auto-embeds and iframes to show content from services like YouTube. If your school has enabled them, you can also add LTI Links and Tin Can files to your lessons. This article describes how to make changes to your lesson after you've designed it. What will my students see? To see how the lesson will appear to your students, click the View tab at any time. Go to the Course > Lessons view. Click the name of the lesson you wish to edit or design. Once in the lesson, click the Design view. Before we get to that, here's a look at how to add pages to your lesson. Pages let you break up the lesson into smaller chunks. If you want to paginate your lesson, start by setting up your pages. If not, you can just start adding materials to the lesson. Click add next to Pages. Give the page a name. After you do this, the new page will list below the previous one. The name of the page you're currently looking will appear in bold. To view or design a particular page, click its name. To change the page order, click Reorder pages. Drag the pages into your preferred order by pressing and dragging . Click Done reordering to finish. Click to edit the page's name. In the edit dialog, you'll also have the option to Delete the page. Headings are simply a line of text introducing a section of the lesson. In the text editor window, enter your notes by typing or copy-pasting from another document or website. Keep in mind that copy-pasting will probably alter the original formatting, so look over your pasted content before proceeding. Within the text editor, you can change the text size, add headings and some light formatting, create numbered or bulleted lists, and link to other sites. If you're not sure which button does what, just hover your mouse over it and you'll see a label describing the action. Embed media hosted by Populi by copying the embed code from one of your media files (see "Files", below). You can also click the Upload image symbol to include a picture. You can add any existing assignment to your lesson. 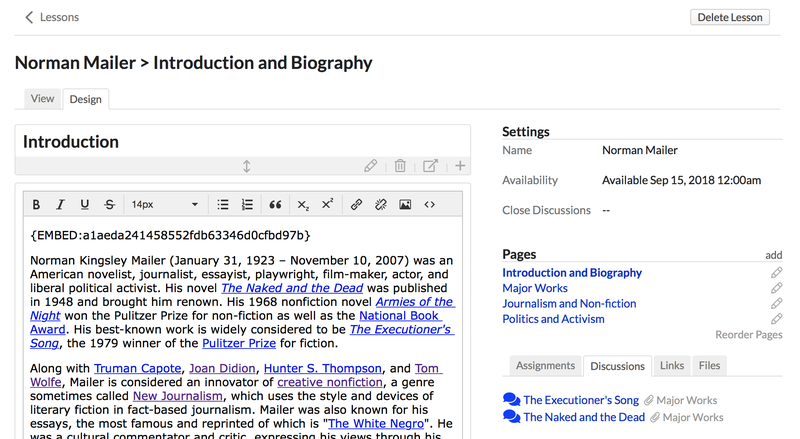 Assignments link students to the assignment's page, where they can submit their work and interact with you in the assignment feed. You can make assignments optional for the lesson OR require students to complete them before proceeding to the next lesson. Select the assignment from the drop-down. Check if you wish to require that students complete the assignment in order to access the next lesson. "Completing" the assignment depends on the assignment type. The student must have submitted a test, participated in a discussion, uploaded a file, or submitted an essay. If you add a grade-only assignment, the student will not be considered complete until you enter a grade for him! 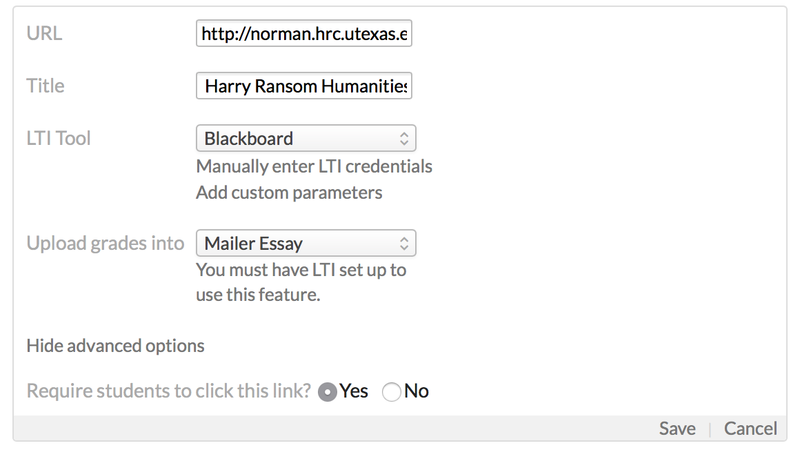 You can also use a link to send students to an assignment hosted in another LMS by using an LTI tool. See the section on Links, below. Create a new lesson attached to the discussion. Include an existing discussion—whether by adding a discussion or adding the assignment for a graded discussion. Use a section of the lesson to require students to start a discussion (and then require students to participate in at least one such student-led discussion). Select an existing, non-graded discussion or the New discussion option from the drop-down. If you're adding a new discussion, you'll then have to enter the discussion details. Check to allow students to start discussions in this lesson section. If you check Yes, you'll also have the option to require each student to start a discussion in this section. Check to require students to participate in the discussion to complete the lesson. In the lesson's settings, you can set a date to close all discussions (after which no one can contribute to them). If you include an existing discussion (graded or not) that already has a different Comments Closed date, this setting will not affect that date. You can still manually-close comments for any discussion on that discussion's page by editing the Comments Closed setting to Yes. This article describes how to embed files in lessons. Search for the file or drag-and-drop it into the upload area. You can also import a file from another course. Check if you wish to hide this file from your students. Do this if you wish to embed a media file elsewhere in the lesson (or course). Check to require students to view or download the file to complete the lesson. You can use links to send students to another site or to an assignment page in another LMS using LTI tools. Enter a display name for the URL—if you don't enter anything here, the lesson will just display the raw URL. Check to require students to visit the link to complete the lesson. If you need to change your lesson around, have a look at this article.